LWRC IC-DI MK II Target 18 inch Rifle Chambered in .223 Wylde, a tighter more accurate chamber, resulting in better accuracy and reliability. The LWRC DI MK II Target comes equipped with upgraded 16 inch M-LOK Handguard, Theirs no need to buy propitiatory rails. 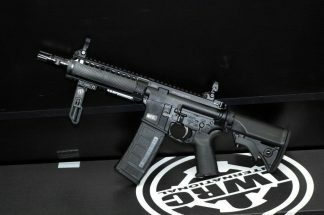 LWRC DI Target Rifles have been giving Daniel Defense a huge run for the money, LWRC has hit a home run with their DI rifles. The LWRC IC-DI MK II Target is no exception, it is what the public has wanted in a LWRC Direct Impingement Rifle. The LWRC IC DI MK II Target Rifle is being introduced at the NASGW and 2018 Shot Show in Las Vegas Nevada. LWRC Direct Impingement MK II Target Rifle always in stock at Xtreme Guns and Ammo “Nations Largest LWRC Dealer” located in Richmond Texas. Feel Free to call Xtreme Guns and Ammo at 832-363-3783 For all your LWRC IC DI Rifle and LWRC Rifle questions and needs. Our chat with us online during regular chat hours.